A. We are currently seeking patterns and articles for our Spring issue, which will go live in March 2015. We publish our seasonal issues a little early, so that crocheters will have time to make the designs we provide before the season’s over! For Spring, think light and fun! We’re looking for light layers with bright colors! Cardigans or lightweight wraps, pretty hats and bags, and we’d love to publish patterns for toys, jewelry, home decorations and more! Think you have a winner? Send it in! Please follow submission guidelines carefully! Submissions will be edited for clarity and style. All submissions should be sent to the editor (crochetsubmissions AT gmail DOT com). All design submissions must be received by January 31st to be included in the Spring issue! Please ATTACH the following to your email, do not embed into it. Multiple high-quality digital photos of your finished design. Please send JPG images only, a minimum of 700 pixels wide. Send as many photos as you can! We need pretty shots, close-ups of details and stitch patterns, and full-length shots of the whole project. A note about photos: please make sure the pictures you send are clear and well-lit. We will not be able to evaluate your design properly if we can’t see it! Unless you have professional photography equipment, the best way to get a good photo is to use natural lighting (meaning, outside) with no flash. The flash flattens out the texture of your crocheting and makes it difficult to see the details. Not good! Please also have your item modeled, if possible – we’d much rather see your scarf on a person than on the back of a chair! Unfortunately, even if your design is spectacular, we will not be able to publish it without good photos. Written submissions must be received by January 31, 2015 to be included in the Spring issue! Please ATTACH the following to your message rather than embedding it in it. High-quality photos or illustrations in JPG format, at least 700 pixels wide. Well-lit, clear photos enhance the reader’s experience of your writing! I would like to ask you a question unrelated to your submission guidelines. 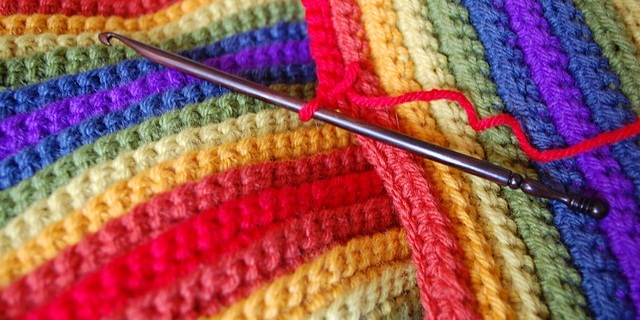 As I am still very new to crochet I can not recognize the type of stitch you used in the photo above (the rainbow stripes). I like that the colors do not blend, but stay in “their row”. I would be very grateful for your answer. Hi Mia! The stitch in the picture is just single crochet worked through the back loop only, but I’ve used two rows in each color and so they stand out quite well. Hope this helps! I’m very new to this, so please forgive me if this is an obvious question. Do the patterns have to be tested before submission? If so, by how many testers? Hi Kelly. Patterns do not need to be tested; you have what you’ve made and I go over the math to try and catch any errors. You are welcome to have it tested, but it’s not required. Hi! Are you accepting submissions for your winter issue yet? Thanks! Yes, yes we are. Just label them as being for the Winter issue and you should be good to go! Hi, another obvious queston. I saw that you wanted sizes for your pattern submissions. A scarf does not have a size. Would you like measurements? Hello! this site’s style is cracked in my Opera. Maybe you should check it. cool post tho. will you accept designs for kids?